We respect the privacy of our customers. We do not sell or share names, addresses, phone numbers or email addresses. We use these only to process your order and to let you know about events, sales etc. that are relevant to The Artistic Pony Studio, Ltd.
We offer store credit on returns and exchanges only. Most of our items are handmade and unique. Our artists stand behind their work and can make repairs as needed. If you have any problems with a piece you have purchased please contact us right away. We make every effort to photograph our pieces to represent them accurately. Some views will be smaller to show the entire piece or larger to show detail. Most of our items our handmade, imperfections can be part of this process but not to the detriment of the piece. Most pieces in our catalog are hand made and unique. These items are sold in a quantity of only one. Artisans may be able to create pieces that are similar but please note that no two pieces will be exactly the same. Our store is based in the lovely city of Solvang, California, located in the heart of the Central Coast Wine Country and part of the Northern Santa Barbara County. Please feel free to visit us sometime at 446 First Street. Most orders will arrive in 1 to 2 weeks. For rush orders please contact us at (805) 686-9899 or toll free at (888) 820-PONY (7669). What if the order arrives damaged? We ship products out in the best and most secure packaging available, and only on rare occasion will there be a damaged order. If the package has obvious damage and the product has also been damaged please refuse the order and call us as soon as possible so that we can rush you a replacement order. If there is not visible damage at the time of delivery and you find the product damaged after opening the package you will need to contact us immediately. Replacement items or parts will be sent out immediately. ALL DAMAGES MUST BE REPORTED WITHIN ONE WEEK AFTER RECEIVING THE ORDER. Once we have processed and shipped your order we are than unable to cancel the order. If the product has been shipped you will be responsible for inbound and outbound shipping charges. These charges will be deducted from your refund. Sales tax will be charged only to orders that are shipped to California and will be calculated in your final total. UPS, USPS or Federal Express Deliveries - When possible, your merchandise will ship via UPS, USPS or Federal Express. UPS and Federal Express will usually deliver to your door but they will not notify you prior to delivery. 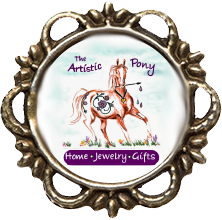 The Artistic Pony Studio, LTD. accepts Visa, MasterCard, Amex, and PayPal. Sorry we do not ship orders COD.